Observations of waves in Jupiter's atmosphere have been made by several spacecraft, starting with Voyager, and this has continued with recent observations by the Hubble Space Telescope in the visible and Very Large Telescope observations at 5 microns. The JunoCam instrument has identified waves structures on a finer scale (smaller than 170 km) that have ever been observed previously. 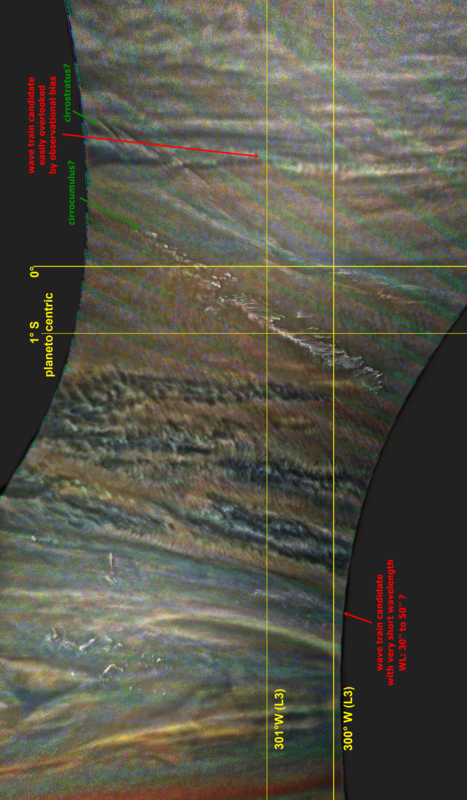 One of these is apparent in the PJ7 observations of the northern edge of the Great Red Spot. But others are apparent elsewhere, primarily near the equator, on other perijoves. This thread will mirror work by the team leading to a published paper summarizing these results with a planned submission in early summer of 2018. I 'made a presentation on what we've done on mesoscale waves to date at the 2018 American Astronomical Society's Division for Planetary Sciences meeting (on their 50th anniversary). It was picked up as a press release by the AAS and the DPS press officers, and it's available here: https://www.jpl.nasa.gov/news/news.php?feature=7264. There was a press conference in which I participated that was Webcast and recorded; it's available here, with my contribution (the second of three speakers) starting around the 12:00 mark: https://aas.org/medi…/archived-aas-press-conference-webcasts. My abbreviated presentation power-point for the press conference can be accessed here: https://aas.org/files/resources/dps50_glenn_orton.pdf?fbclid=IwAR0BpROHwyoSvpQSBM1WdtyTLOE66fkY7bT7g9avh6czyCDGtEyupTE4tHI. I also attach my full formal presentation. My goal is to get this submitted to publication by early in 2019. The high-pass filtering is context-sensitive and adjusts for the local standard deviation of according illumination-adjusted maps. This maintains a similar local contrast across the maps. Some of the PJ12 maps have been cropped into stripes in order to reduce rendition time. Several of the maps are provided as a less processed version, too, especially when rendered for the first time. The maps are rendered approximately in planetocentrical cylindrical equidistant format with north to the right, and with a resolution of about 180 pixels per degree. Residual projection inaccuracies are possible. Links to the processing parameters, especially regarding the longitude and latitude ranges, are planned to be provided later. This is a poster to be presented at the Asia-Oceana Geosciences Society (AOGS) 2018 meeting that summarizes much of our work in the last few months on the identification and characterization of waves and wave-like features in Juno's Perijoves 1 and 3-13. We didn't have room to include the high-pass processing on images that has been done in order to look for very faint indications of waves and wave-like features, so this survey is more-or-less complete only insofar as waves are easily recognizable. For many images, we also have quantitative measurements of the latitude and longitude bounds of the wave, together with measurements of the distance between the waves (wavelengths) in km. Some crop of an enhanced cylindrical map PJ12, #90. A link to a larger map is provided in the comment below. The maps are averges of two processed maps, one map gamma stretched after illumination adustment, the other map filtered by a context-sensitive hipass filter that adjusts for local contrast. Some more subtle wave train candidates are easily overlooked in the context of the very distinct ones. Note, that I've been off by 180 degrees longitude with respect to System III. 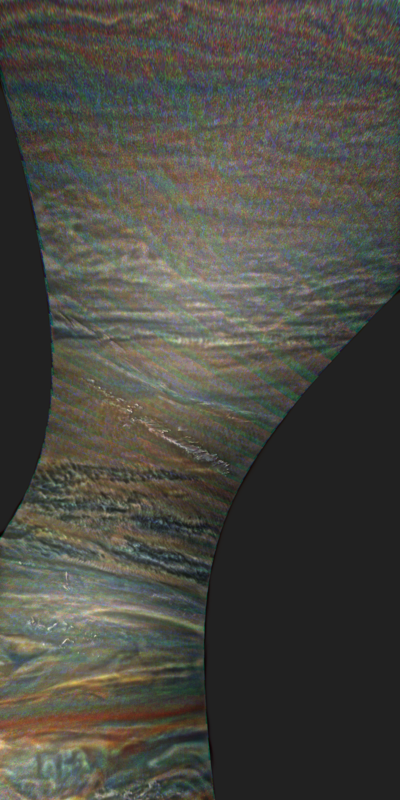 Here is a version of image PJ12_90 that has been processed and filtered to reveal a lot of mesoscale waves, many of which appear rather subtle if no processing is applied. Because of the wide field of view the image has some perspective foreshortening. Therefore an approximately true color/contrast version with a latitude/longitude grid is included. Latitude is planetographic. A global context render is also included. It is based on Marco Vedovato's map that includes images from March 29-31, 2018.